End of tenancy cleaning in reading refers to the specialist deep cleaning of your rented flat or house before the new tenants move in. It’s also called move out cleaning, End of tenancy cleaning and just deep cleaning. Are you moving out or renting? No matter if you are a tenant, landlord or estate agency, our end of tenancy cleaning in Reading is suitable for everyone who is moving in or out of a property. We offer a top to bottom thorough cleaning service, guaranteed for 72 hours. So as a tenant, you can be confident that you’ll get your security deposit back in full without trouble. Or if you a landlord, you’ll have your entire property professionally cleaned and ready for new tenants. Note: To get the most accurate price estimate, when you fill the online form below please share the information about the number of rooms that have to be cleaned, the current condition of the property, are there any additional areas you need to be cleaned – balcony, stairs, hallways, etc. We know all the requirements of letting agencies, landlords and the end of tenancy inventory check. 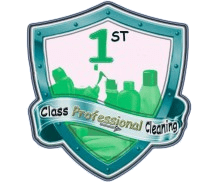 Based on this, we at 1st class professional Cleaning have created a detailed end of tenancy checklist to follow, which entirely covers all their conditions. Starting from the kitchen, focusing on the all appliances, such as the oven, stove top, range hood, dishwasher, fridge, freezer (defrosted), washing machine, toaster, microwave, tumble dryer, clean them internally and externally. Clearing out all cupboards (inside and out), not missing the handles as well. De-scaling and polishing the sink and taps. Wiping down all surfaces and mopping the floor. Removing any limescale from tiles, cleaning mirrors and shelves, sanitising the toilet and the bathtub, dusting the radiator and towel rail, wiping the dirt from the extractor fan, hoovering and mopping the floor. Continuing with the other rooms, the cleaners pay attention even to the smallest things, like light switches and door handles. Thorough dusting all surfaces, removing cobwebs, cleaning picture frame and mirrors, window frames and sills inside, vacuuming the carpets and mopping the floors. Running cold and hot water, lights and electricity. Parking space close to your home. No personal belongings should be left inside the property. Furniture can be present but bear in mind that we do not move heavy furniture. Note: If someone is still living there or there are any personal items, we can’t do an end of tenancy cleaning. A deep domestic cleaning is a better solution in that case.